I order Thai and Indian takeout at least once a month but I have never tried to make it at home. 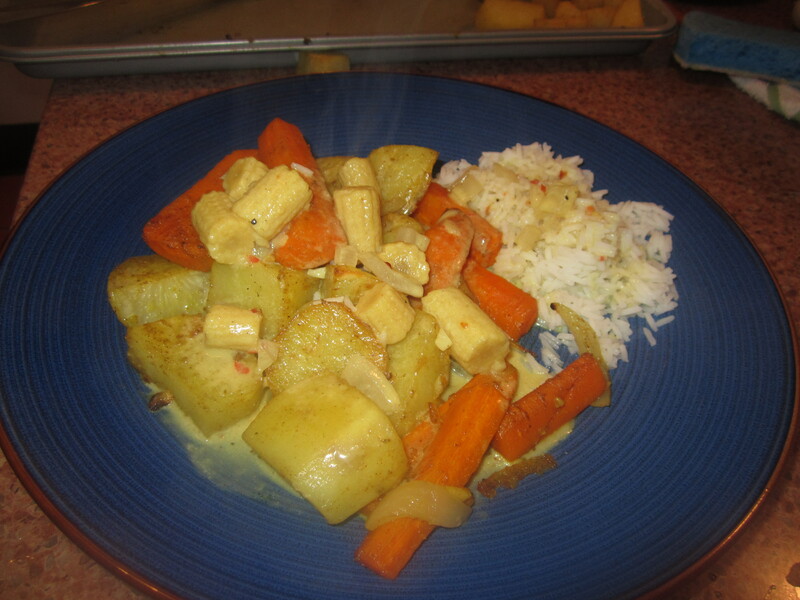 After browsing the internet for some time yesterday I decided I wanted to try a curry at home. I went to Wegman’s with no recipe in hand and just grabbed ingredients that I thought would blend together and to my surprise the recipe was a success. I hope you enjoy! Side note about spices: As you can see I don’t measure spices-it takes the fun out of cooking. I just sprinkle and taste and if I think it needs more than I sprinkle again! 1.) Start by peeling the potatoes and carrots, cut lengthwise and then chop into bite size pieces. 2.) Mince 3 large garlic cloves and chop ½ of the onion into larger pieces. Place the potatoes, carrots, onion and garlic on a large baking pan. Sprinkle with curry powder, ground ginger, cumin and olive oil so that every item is lightly covered. See picture below. 3.) 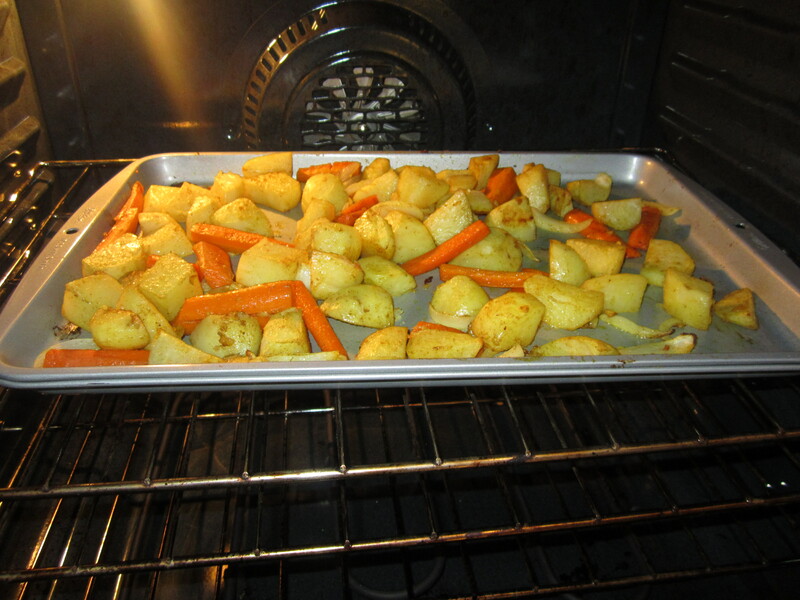 Bake at 425° for 35 minutes or until potatoes and carrots are cooked all the way through. 4.) While the potatoes are in the oven start your 1 cup of rice, follow direction according to package. 5.) On a medium-sized skillet or wok put two tbsp. olive oil with ½ white onion diced over medium low heat. When the onions have turned translucent add 1 clove of minced garlic. Add spices to taste; curry powder, ground cumin, turmeric, red chili pepper flakes and ground ginger powder, bay leaves. 6.) 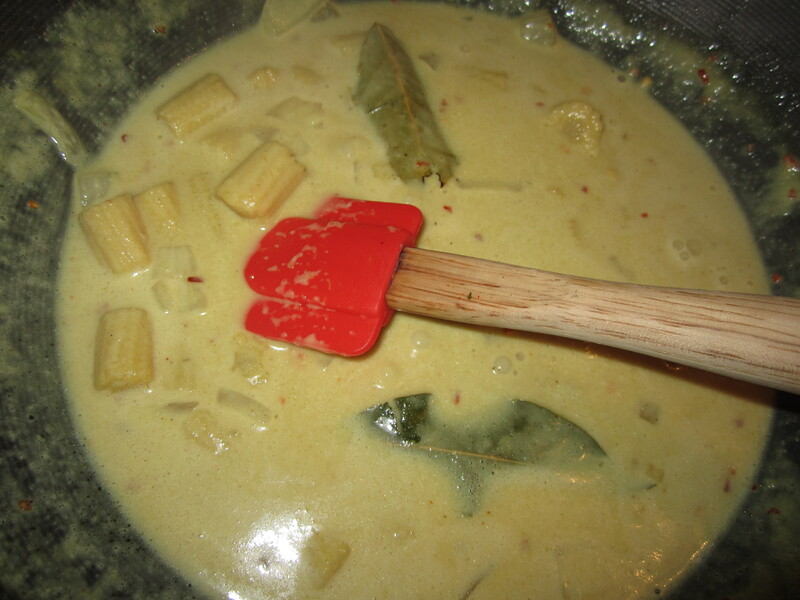 Pour in the coconut milk and stir until it is a broth like consistency, add the curry paste and corn and let all the flavors marinate for 20 minutes or so under medium low heat, stirring frequently. 7.) When the potatoes and rice are done serve and enjoy!